Neurotransmitters are chemical messengers that help relay information throughout the body. 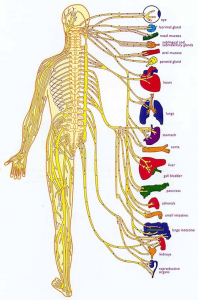 They transmit information through nerve cells called neurons. 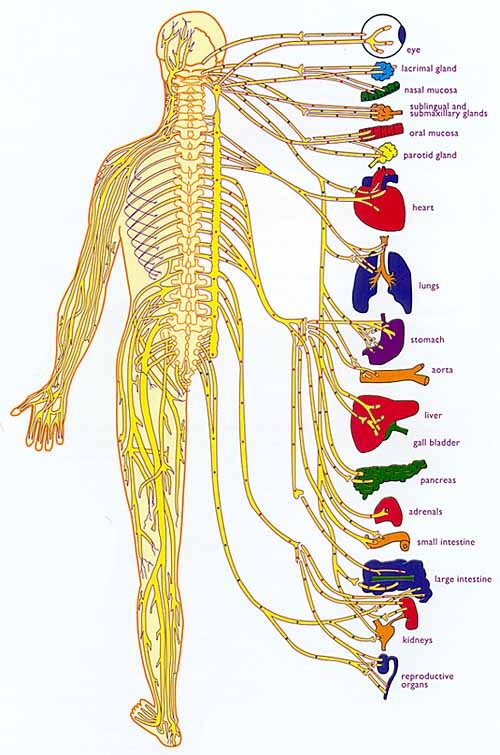 In its most basic form a neuron has two ends (although either can have multiple branches): an axon and a dendrite. 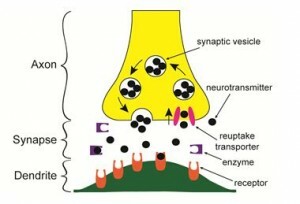 A neuron communicates with other neurons by sending neurotransmitters from its axon to a dendrite of another neuron. The space between the axon and the dendrite is called a synapse; this is the space across which a neurotransmitter must cross. It’s a lot like electricity going through a wire. Turning up the voltage will cause more electricity to go through the wire. In our case, the neurotransmitters act like electricity – if we have enough electricity, the lights will come on and things will run smoothly. If we don’t have enough electricity, things just don’t work like they should. If the neurotransmitters are taken back up into the pre-synaptic neuron via the reuptake transporters, they are protected and can be used again. However, if the transporters are blocked (as is the case with selective serotonin reuptake inhibitors and other medications), the neurotransmitters are eventually destroyed and cleared from the system by enzymes. Ant Depressants alter the Neurotransmitter functioning system with intention to balance the system. Much evidence now exists that these Psyche Drugs are damaging the balance of Neurotransmitters and causing severe physical and mental problems that the patient did not have initially. These drugs have been called Chemical Lobotomies. The court filings against these drugs or abusive prescribing of them are increasing every day. What is your opinion? Hi Nancy – thanks for your thoughts on this subject. It is certainly true that many/most antidepressant medications can exacerbate and/or cause neurotransmitter imbalances which can lead to numerous symptoms. However, it has been our experience that these symptoms can be managed/overcome using appropriately dosed amino acid therapy. Some of the neurotoxic damage from the medications may be permanent, but even in these cases we can almost always compensate for the damage by pushing through sufficient/balanced amino acids/neurotransmitters using the viable neurons. Marty Hinz, MD has published some great work in this area; here is a link where you can find out more: http://www.neurosupport.com. If I discover that this therapy helps me, how long would I have to be on it? Is this something I would have to take the rest of my life or will it get better with therapy?